Irvine has a long history and much of this is still visible within the historic heart of the town. 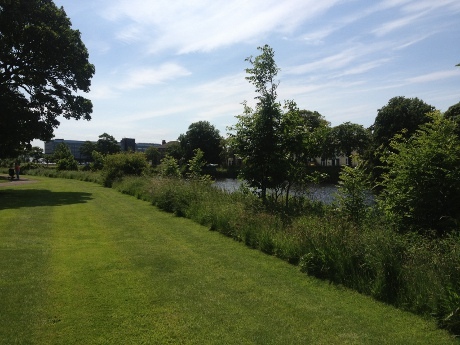 We have created this historical town walk that will guide you around some of the most historical parts of the Irvine. 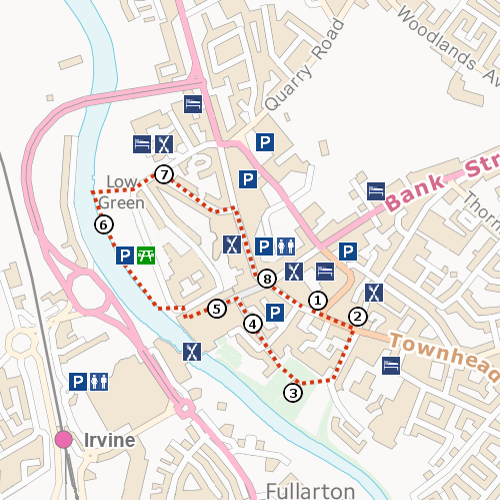 This walk begins and ends within Irvine town centre and this area can have high levels of traffic at peak times. There are many different facilities along this route including several cafes, restaurants and pubs. Public toilets can be found within the town centre and within the Rivergate shopping centre, though these are closed outside of business hours. The Low Green area of the route offers an excellent opportunity to relax for a picnic while the kids enjoy the park. Some of the streets within this route have cobblestones which may cause some difficulty for wheelchair users or those who use walking aids. The access to the Old Parish Church from Kirk Vennel is not suitable for wheelchair users due to heavy swing gate. Wheelchair access to the Old Parish Church can be made from Kirk Gate, which sits opposite the Townhouse. The route from the Trinnity Church to the Low Green includes a steep public staircase which is not suitable for wheelchair access. An alternative route would be to travel from the Trinity Church to Irvine Cross and then use the public path that runs along the side of the Kings Arms pub on to West Road, this leads to the Low Green avoiding the staircase. Starting at the Townhouse which is located on High Street, in the centre of Irvine walk towards the mini roundabout that sits in front of the Burns Tavern. Use the pedestrian crossing which sits close to the roundabout to cross the road. Continue along High Street until you reach Glasgow Vennel which is on the left at Soundtec Classical Organs which sits on High Street. Glasgow Vennel is where Robert Burns worked and lived during his time in Irvine and remains one of the historical streets in Irvine. As you walk up the cobblestones you will find the Heckling Shed on your right hand side and the Buchanite Meeting House on your left hand side. When you are ready head back to the start of the vennel and cross High Street to Kirk Vennel. This will take you down towards the rear of the Old Parish Church. 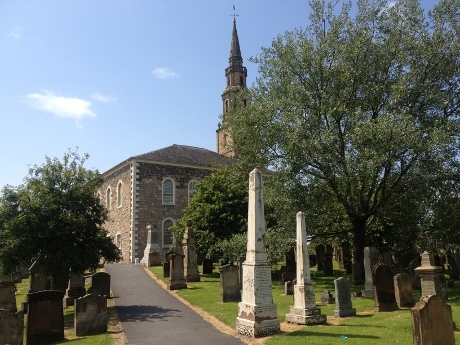 This entrance to the Parish Church is not suitable for wheelchair access, if you require wheelchair access you should proceed back along the High Street towards the Townhouse and go down Kirk Gate which is on the left hand side of the road. Once in the grounds of the Old Parish Church you will find yourself in a graveyard containing almost 1,500 memorial stones. Head to the main entrance of the church grounds and head across to the entrance to Hill Street which sits on Kirk Gate. Hill Street is one of the oldest known streets in Irvine and still possess much of it’s historic charms with small cottages lining the narrow sloped street. This street leads down into Bridgegate at the heart if Irvine’s town centre. Once at the bottom of Hill Street take a left turn and after a few steps you will see the Trinity Church sitting in top of the hill, overlooking Bridgegate. 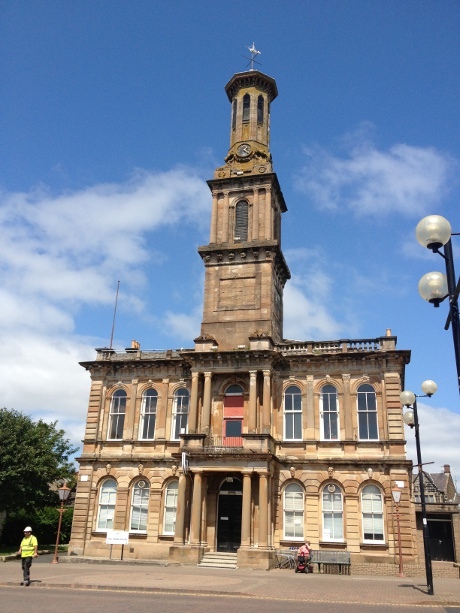 This area of Irvine town centre is currently under going major redevelopment, and part of this is to restore the exterior of the Trinity Church and to renovate the interior so that this historic building can be brought back into use. There is a variety of shops in this area and next to the Trinity Church there is access to the Rivergate Shopping Centre which is the largest shopping mall in North Ayrshire. 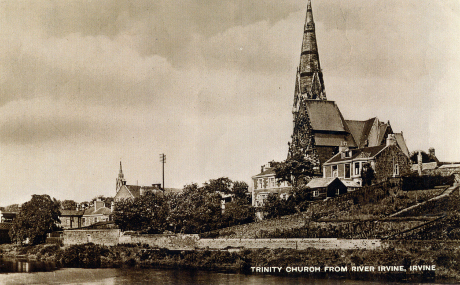 Going past the Trinity Church, head down the public path next to the Irvine branch of Santander. This will take you to a steep public staircase which leads to the Low Green. This part of the walk is not suitable for wheelchair access, however an alternative route for wheelchair users. Head up Bridgegate, away from the Santander branch until you reach the road at the town centre. From here take a left turn and then down the lane that runs along the side of the Kings Arms public house. Then follow East Road, down the hill towards the foot of the public staircase. Once at the foot of the staircase follow the path towards the river bank and then follow this along the river towards the Low Green. As you walk along the path towards the playground that sits within the Low Green you will pass the trade pillar, this pillar represents the medieval trades of Irvine. The row of housing that sits on the opposite side of the river is know as the Waterside. The Low Green is a popular leisure and recreational area and is commonly used by families to have picnics and to enjoy a sunny day. When you’re ready to leave the Low Green head back towards the Low Green Road, passing through the car park beside the children’s playground. 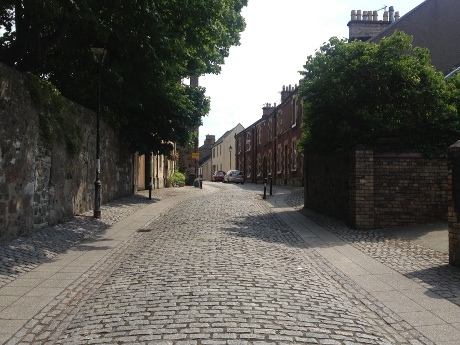 Follow Castle Street up the hill towards the Boyle Statue which sits on your right hand side. 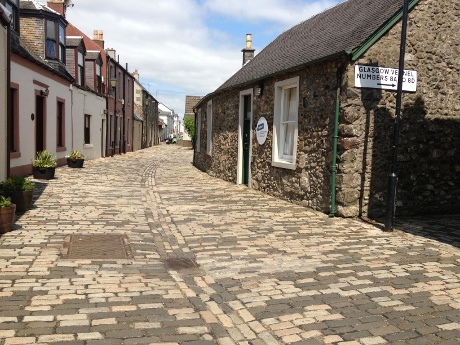 Continuing past the Boyle Statue you will come to Seagate, this is a cobbled street that runs from Castle Street into Irvine town Centre. This street was the subject of major regeneration work back in the 80’s and 90’s in recognition of it’s significant historical interest. 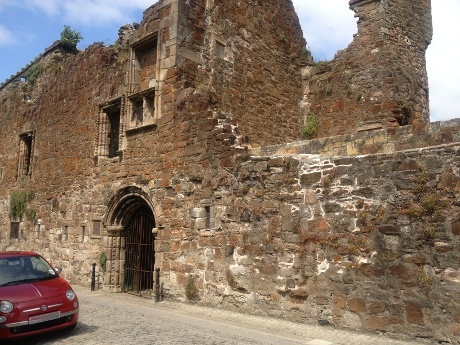 As you walk up Seagate you will come across the ruins of Seagate Castle which sits at the entrance to Seagate. Continue up Seagate until you reach High Street, this was traditionally the main shopping area of Irvine and still has a wide range of shops, cafes, restaurants and pubs to visit, though the range of shops available has steadily reduced since the construction of the shopping mall and retail parks that exist within Irvine. Continue down Irvine High Street passing the local shops until you reach the cross roads between High Street, Bank Street and Bridgegate.